Standing on the shoulders of tyrants | O'Really? If we have seen farther it is by standing on the shoulders of giants. If we have seen farther it is by standing on the shoulders of tyrants. Take Isaac Newton for example, a giant whose shoulders we all stand on today. During his scientific career he employed plenty of tyranny to get ahead. While devising his calculus Newton had a bitter rivalry with his contemporary Leibniz where he exploited his position of power and influence at the Royal Society  to discredit his opponents work. Newton was evidently no gentle giant. Over at the BBC, Marcus du Sautoy charts some of this murky political territory in the first episode of his entertaining Brief History of Mathematics series. The rest of the programmes introduce some of the other colourful personalities involved in the history of “the queen of the sciences”. 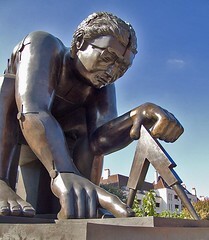 So if Newton is anything to go by, many of the giants shoulders we stand on were (and are) terrible tyrants. While friendly and open collaboration is important in Science, cut-throat competition clearly has a place too. wait, did you just confuse is for ought, and correlation for causation? well I see your point but I’m not saying ALL giants are tyrants, just that SOME (or possibly MANY) giants are tyrants.